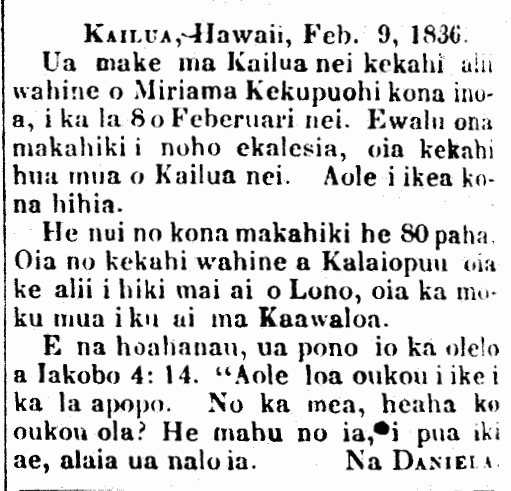 Kailua, Hawaii, Feb. 9, 1836. Died here in Kailua was the chiefess named Miriama Kekupuohi, on the 8th of February. She belonged to the church for eight years, and she was one of the first converts of Kailua nei. She was not known to have any entanglements. She was very old, perhaps 80 years old. She was a wife of Kalaiopuu,* the chief when Lono [Captain Cook] came, in the first ship to arrive in Kaawaloa. O Brethren, very true are the words of James 4:14. “Whereas ye know not what shall be on the morrow. For what is your life? It is even a vapour, that appeareth for a little time, and then vanisheth away.” By DANIELA. *Kalaiopuu was also known as Kaleiopuu and today is more commonly known as Kalaniopuu. Ke Kumu Hawaii, Buke 2, Pepa 6, Aoao 24. Maraki 16, 1836. This entry was posted in Alii, Aloha Aina, Death Announcement and tagged Daniela, James Cook, Kalaiopuu, Kalaniopuu, Kaleiopuu, Kekupuohi, Lono, Miriam Kekupuohi, Miriama Kekupuohi by nupepa. Bookmark the permalink.